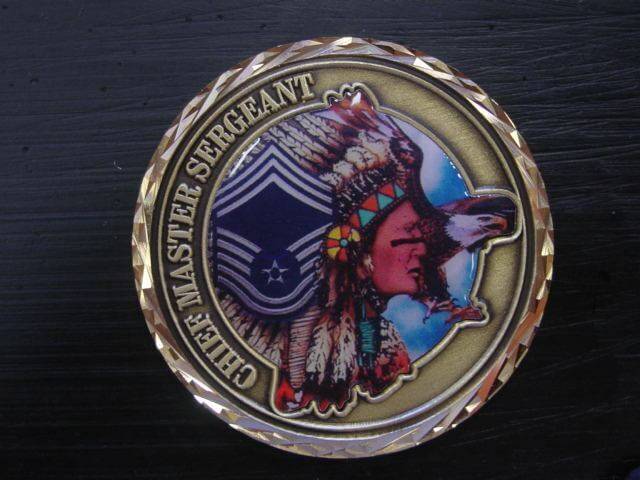 A custom challenge coin is a medallion or, as the military sometimes calls it, a “RMO” (round metal object) that bears the insignia or emblem of the organization it represents. 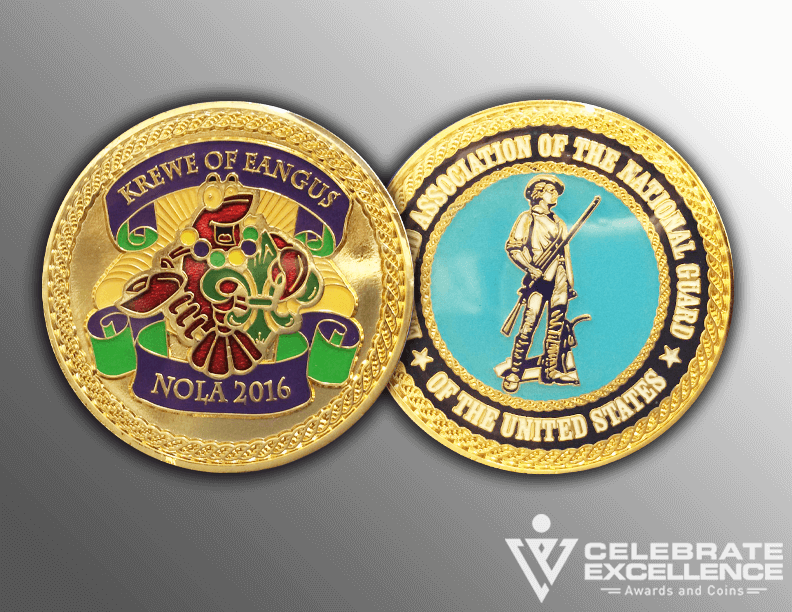 This article will help you in planning and designing a custom challenge coin for your organization. 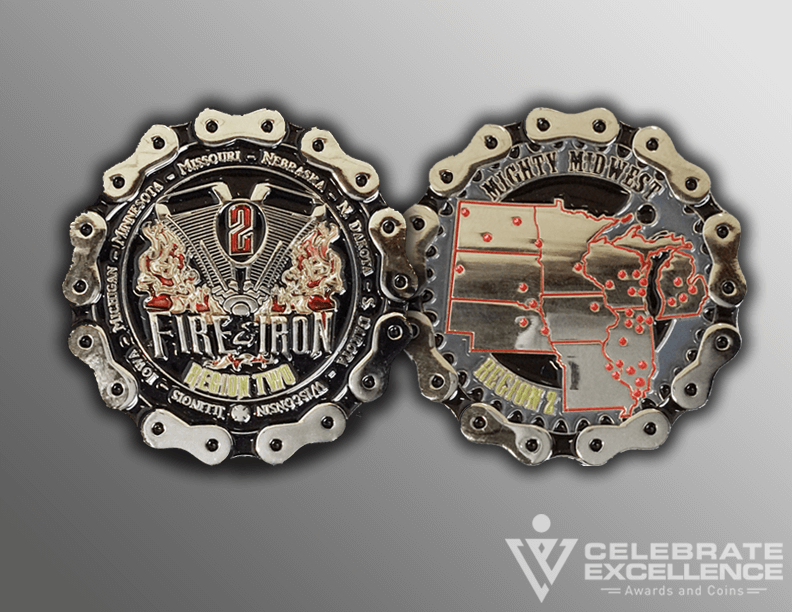 It is important to understand what options you have when designing a custom challenge coin – the end result will be a coin that you will be proud to carry and give. 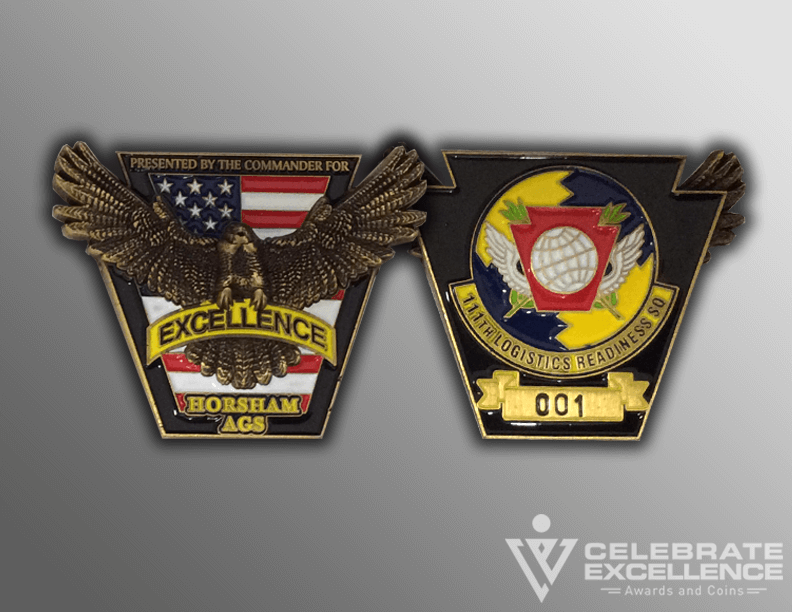 The US military has used challenge coins for decades – as forms of informal recognition from a commander (given in recognition of a job well done) or to signify membership in an organization, group, squadron, company, etc. There are several stories about the origin of challenge coins in modern history. But there is evidence that the tradition of giving an enlisted soldier a coin dates back to ancient Rome. Historians report that Roman soldiers were paid for their service daily. If they performed bravely during battle that day – some soldiers were given an extra coin that, in many cases, was minted with the emblem of their regiment. The most commonly accepted account of the introduction of the challenge coin revolves around a wealthy WWI American aviator – a lieutenant who had medallions made out of bronze for members of his unit. He wore his medallion in a leather pouch around his neck. On one of his missions, he was shot down over Germany and captured. He later escaped to France where he was captured again, this time by the French Army who believed him to be a spy. Just before his execution, a French soldier took the leather pouch, removed the medallion and recognized the unit insignia as American. The young officer was released and returned to his unit. During the Viet Nam war the use of coins began to grow. All branches of the armed forces use coins to signify membership in a unit. Commanders create their own coins and use them as informal recognition – to celebrate excellence and to reward “above and beyond” performance. Booster organizations use coins as fund-raisers. 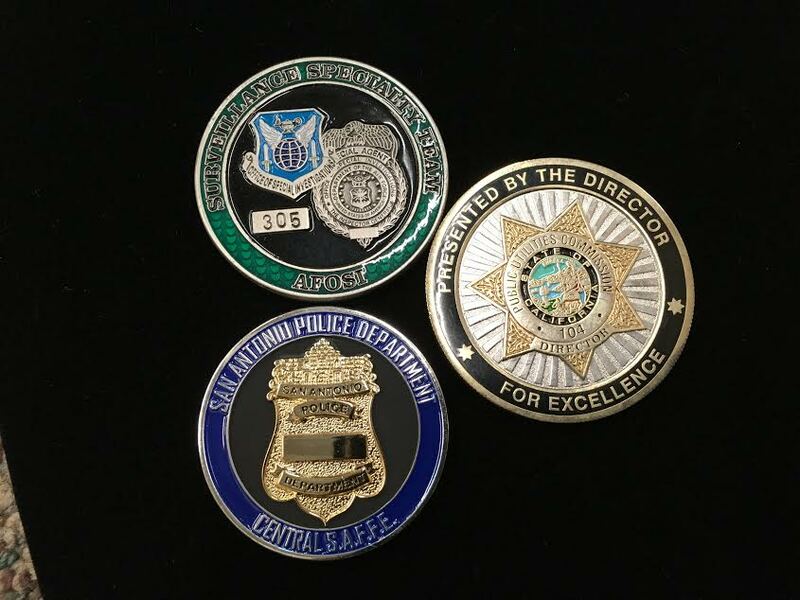 Today, the challenge coin tradition has spread to members of law enforcement and first responders. Businesses have included coins as part of their corporate culture as well. 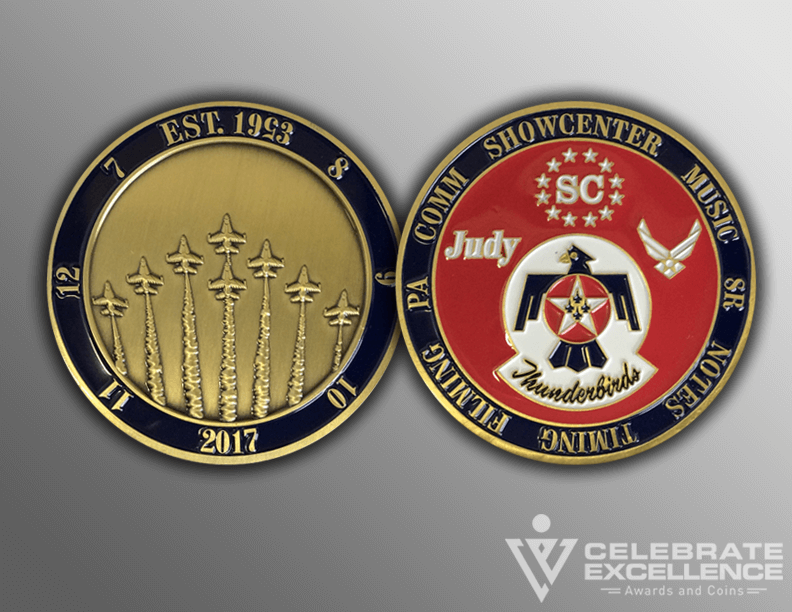 Large and small companies use custom challenge coins to promote their message, to reward members of a team, celebrate the completion of a project, etc. a) BRASS – brass is an alloy (mixture) of copper and zinc. These coins date back to 200 BC when it was used for coins and jewelry. Brass is considered the “military standard” for coins and law enforcement badges. This is the highest quality metal used for coins. brass gives the solid metal “thud” sound when dropped on a wooden bar or table. 3-D relief can be achieved in iron – but the small details will be buffed away during the coin polishing process. If you need detailed 3-D – iron is not the proper metal for your coins. because iron can rust and the electroplating will wear off with heavy use – we recommend that you cover the front and back of the coin with an epoxy dome, edge to edge. This adds weight to the coin and also protects the electroplated finish. c) ZINC ALLOY – zinc alloy results from mixing zinc with any one of a number of other metals – but most commonly with lead or copper. You probably are very familiar with zinc alloys even if you have never heard the term before. Solder is a zinc alloy. Most non-precious silver jewelry is made from a zinc alloy. zinc is a cheaper metal than brass or iron – however, the cost of the die cast mold is high. When you are ordering a small quantity of coins – the price per coin will be high. Once you order 200 – 300 coins, the price per coin drops significantly more per coin than brass or iron. So plan to pay a premium for coin for short runs (less than 200 coins). d) PEWTER – pewter is a very soft, very malleable alloy made of 85% or more tin. The other metals in the mix can be copper, bismuth or lead. The earliest piece of pewter ever discovered was in Egypt and dated back to 1450 BC. don’t assume a website that advertises “metal coins” is using brass. all metal is NOT alike. remember – you cannot tell how much a coin weighs from a photo. Question to ask: What metal is being used to make my coins? All coins are made using 2-D, 3-D relief or a photo insert. These are techniques we use to replicate your emblems, image or badge in metal. Your coin manufacturer will be able to look at the artwork and photos you want included on your coins and will be able to recommend the best way to construct the dies for your coins. It’s important for you to understand the difference in these options so that you are happy with the coins when you receive them. a) 2-D: 2-dimensional metal work involves raising the metal at a 90 degree angle from the lowest area of the coin. For each color of paint you have on your coin, a 2-D metal “dam” will be raised around that area. This allows the factory to inject paint into each area. So – almost all coins have 2-D metal work somewhere on the coin. We can also use 2-D work to recreate images and photos. The metal can be raised to varying heights on the coin – but always at a right angle to the lowest area of the coin. There is no curvature on images or artwork on 2-D coins. The best way to think of 2-D is to think of line drawings of objects. b) 3-D: 3-dimensional metal work involves “relief”. Relief means that there is curvature to the highs and lows on the coins. If you want an object such as your building or your badge recreated in metal – 3-D relief will give you a result that looks like the object was carved into the metal. 3-D relief involves having a CAD image created of your artwork. This is an additional step in the production process. The dies used to make 3-D coins are more expensive than a 2-D die. Also – we recommend that you increase the thickness of the coin slightly to allow for really detailed relief. process onto a thin piece of aluminum. That aluminum is then die cut to fit a recessed area on your coin. This results in an exact copy of your art on the coin. To keep the screen print from scratching – we recommend covering it completely with a thin coat of epoxy. 2-d does not add any additional charge to the coin’s production. 3-D relief will increase the cost of the coin and any die charge if your coin company charges for the initial dies. A photo insert will be the most expensive option – there will be a set up fee, a run charge per insert and the cost of epoxy doming. 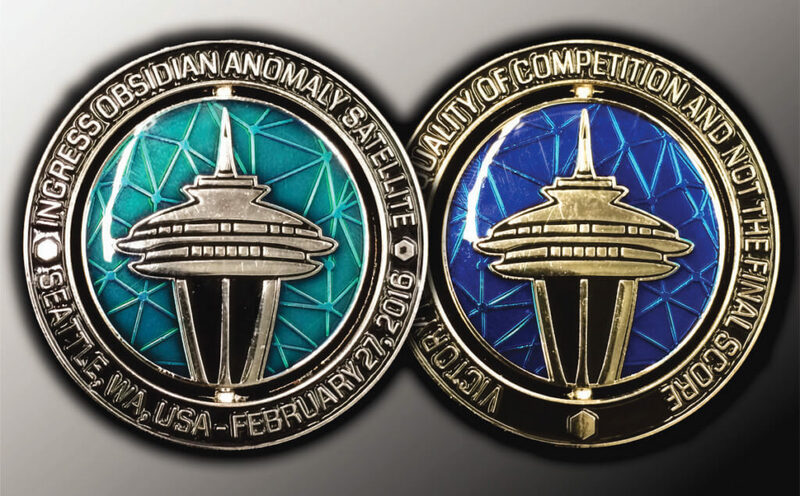 Questions to ask: What technique would you use to recreate the images I want on my coins? Most people do not even think to ask about the paint that will be used on their coins! But the type of paint used makes a huge difference in the look of the coin. a) SOFT ENAMEL PAINT: the military standard for coins is soft enamel paint. In fact, over 95% of the coins we make are painted with soft enamel. Paint is injected using a fine gauge needle into each color area on a coin. The paint forms a meniscus against the metal walls – so when you run your finger over the surface of the coin – you can feel the raised metal. Soft enamel paint is fired once applied to the coins in a 450 degree oven. b) HARD ENAMEL PAINT: also called cloisonne – hard enamel paint contains ground glass. Hard enamel is considered “jewelry quality” and is what is used in most law enforcement badges. Fired in a kiln at 800 degrees – hard enamel coins are then polished by hand with a wire buffing wheel. During this process, the metal raised lines are buffed down even with the paint. Instead of buffing away – hard enamel paint gets more polished the longer it is buffed. The end result is a paint that is even with the highest level of metal. 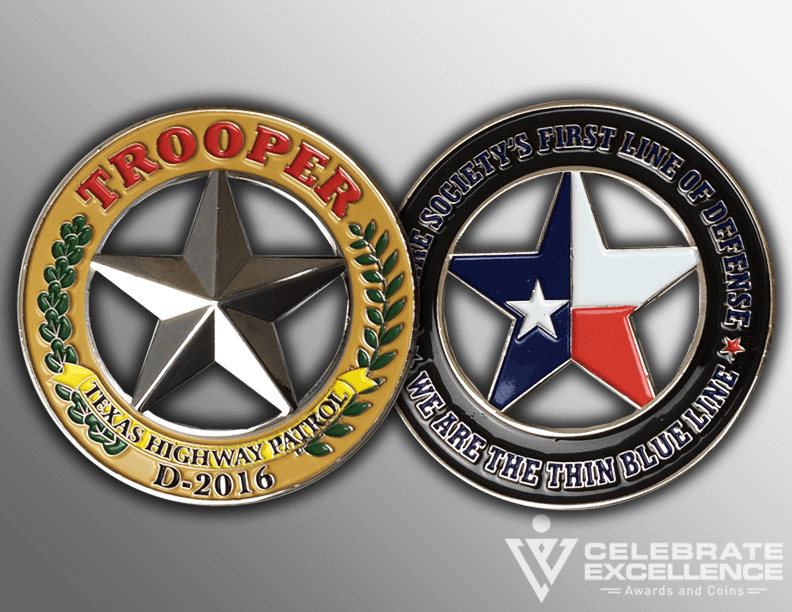 As law enforcement has embraced the challenge coin culture – the number of hard enamel coins has increased. 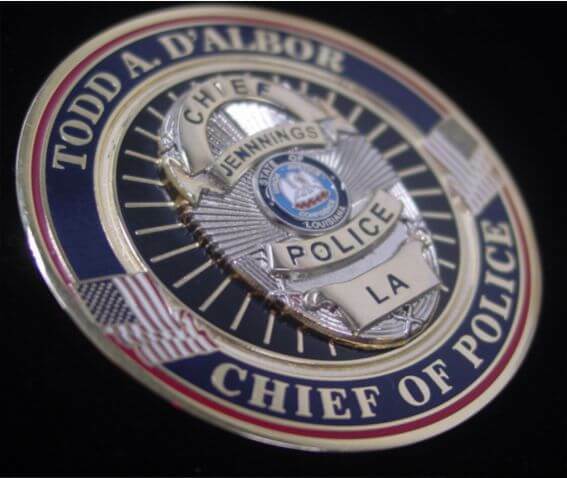 Those who want their badge recreated on a coin often choose hard enamel – this includes Police, Sheriff’s offices, Fire Marshals, Fire personnel, Constables, etc. To learn more about soft enamel and hard enamel coins, please watch our quick video which shows coins finished in both types of paint. TIP: consider hard enamel paint for emulating your badge or for a high end coin. Once your coin is die struck or die cast, it is electroplated with a metal finish. Choices for finish include: shiny silver, shiny nickel, antique silver, shiny gold, antique gold, antique brass, black nickel, black dye, shiny copper, antique copper, satin silver and satin gold. We recommend using an antique finish for coins utilizing 3-d relief – the patina (or blackening agent) in the antiquing will sink down to the lower levels in the relief – leaving the higher areas lighter. This increases appearance of depth in the relief. Any shape other than round is called a “special die-shaped” coin. These coins will cost more than an equally sized round coin. Depending on the intricacy of design – they may require a die-cast mold and are therefore almost always made of zinc alloy. Special die-shaped coins include bottle openers. If you need special edging – irregularly shaped (such as the motorcycle chain pictured to your right), for example – then you need a die-shaped coin. All coins that have sharp interior angles, have cut outs or are spinners require special die shape molding. Remember – zinc alloy coins require a hinged die-cast mold. The cost per challenge coin is high for quantities less than 200 coins. 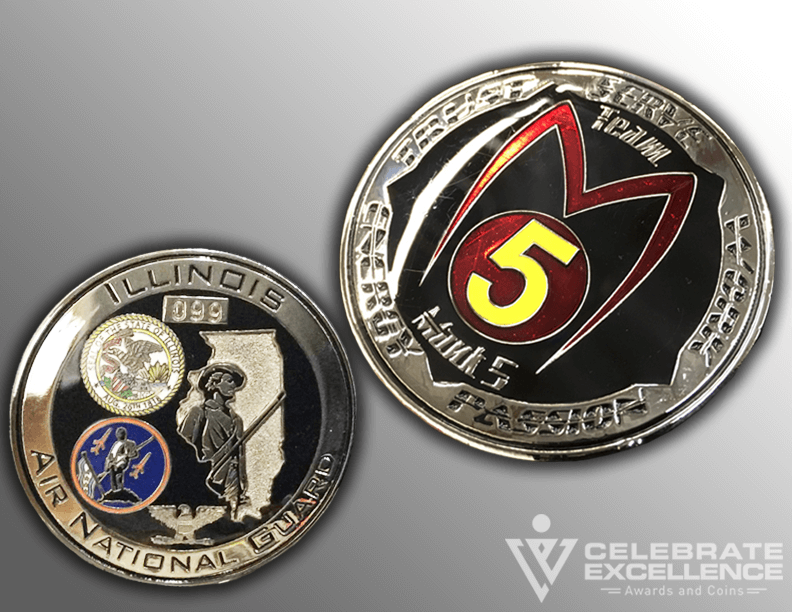 When planning your custom challenge coin, you should consider the kinetic features available to you. Kinetic features are spinner coins and gyro coins. The minimum thickness on a spinner coin is 44 mm. While the coin will be made of zinc alloy, the rod in the center of the spinning features needs to be made of brass. That will insure that the spinner is sturdy and won’t break easily. Spinner coins are expensive when ordered in small quantities (under 200 coins) because they require 4 dies – one each for the front and back of the outside piece; and one each for the front and back of the spinner itself. Gyro coins are coins that have a front piece that moves in a 360 degree angle around the coin – like the hands on a clock. These coins require 3 dies: the front and back of the base coin; the gyro piece that fits on the front. If you add a small “nib” to one side of your coin, squarely in the center, the coin will also function as a top. 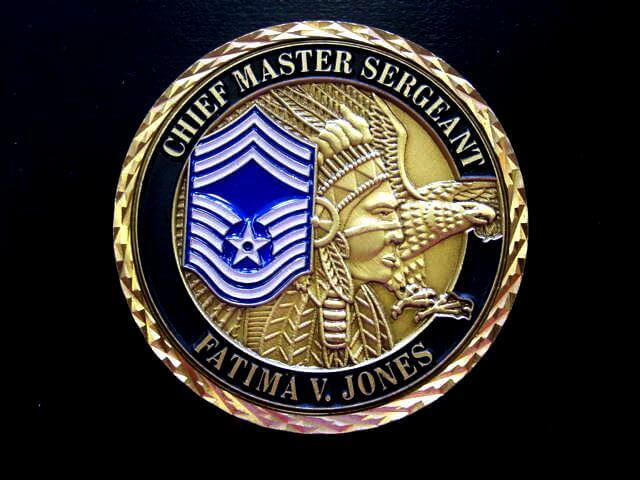 This is another form of kinetic custom challenge coin. 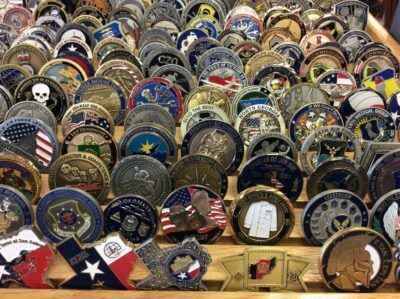 As mentioned earlier, law enforcement personnel have started using challenge coins as collectibles and as a form of informal recognition. Almost always, you must consider how you want your badge recreated on your coin. Your badge is most likely made using 3-d relief. Again – that means curved with varying levels of high and low areas. 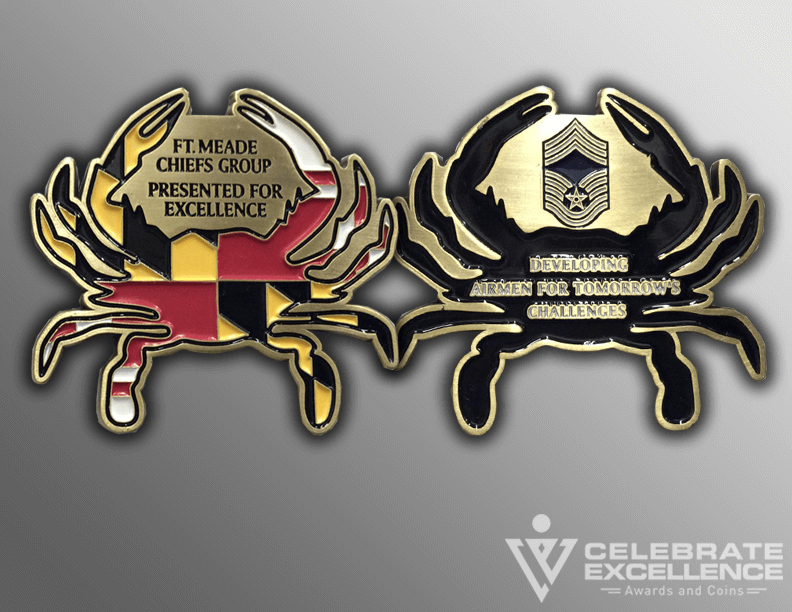 Also, your badge may have been finished using dual-plating – where the badge is plated in one finish, such as shiny nickel, and then the banners or center area are finished in a different plating, for example gold. These are important things to consider – the decisions you make will change the appear of the coin. a) 2-d replica of badge: your badge can be reproduced using simple 2-d relief. Remember from earlier, 2-d relief has no curvature – so the badge is recreated using metal raised straight out of the lowest level of the coin. Your badge’s detailing will be accurate – but the badge will be flat. 2-d relief on a badge does not raise the pricing on the coins. b) 3-d relief of badge: your badge can be reproduced using 3-d relief. The badge will look like it has been “carved” into the metal. 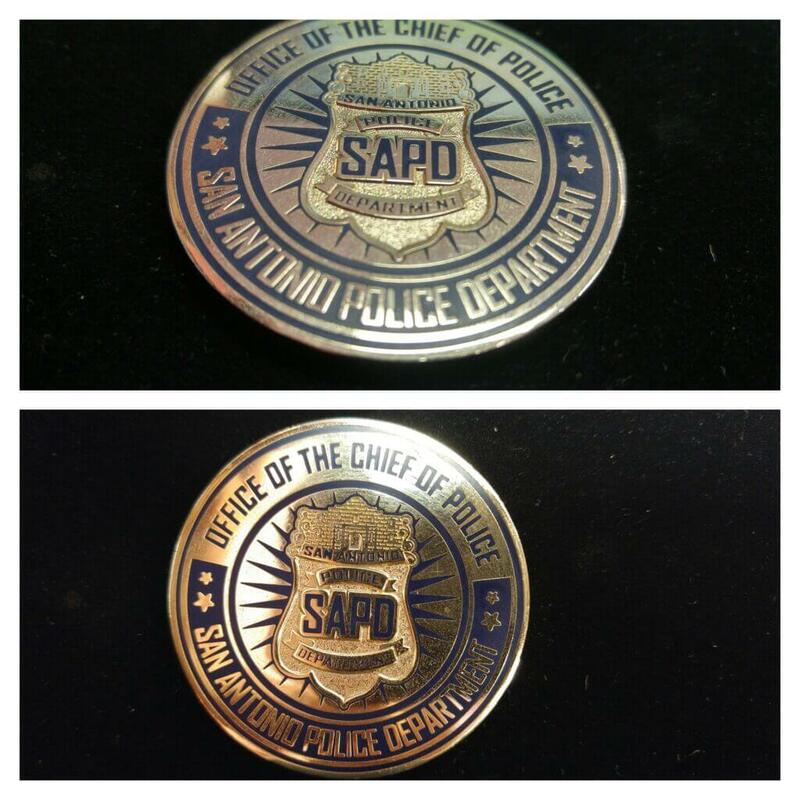 You will see a small replica of your badge as part of the actual coin. 3-d relief requires a CAD image to be made and then used as part of the die-making process. There is an increase in price for 3-d relief. The price depends on the intricacy of the 3-d design and the quantity of coins ordered. c) separate 3-d replica of badge: we can make a separate mold – a separate die that will create a miniature replica of your badge. This is then finished and painted and then soldered to the top of your coin. There is an additional fee for this die and then for each small piece that is die-struck. The die can run $100 – $150 and the cost per coin will increase about $1.20 for the piece and the labor to solder it to the top. Dual plating the badge is a final treatment you can choose. We will plate your coins in the finish you select and then treat the areas that are a different finish in a hand-applied electroplating process. The result will be an exact replica – right down to the finish! – of your badge. The process is time-consuming – the coins are plated in the base plating. Then a laser cut mask is created and applied to each coin. The second electroplating finish is added by hand. The cost for dual plating can be as high as an additional 30% of the base coin. Remember – you cannot tell the quality, base metal or weight of a coin by looking at photos on the internet. Be sure you know what you want in the final product and be sure you choose a coin manufacturer who understands your artwork and suggests the correct metal to achieve the results you want. 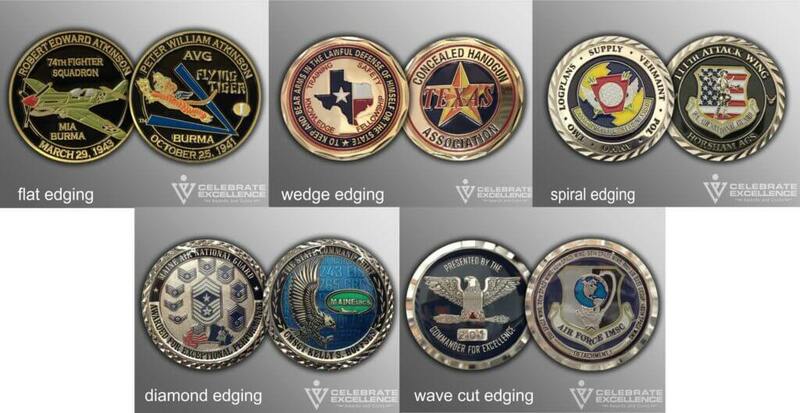 For more information about additional features and options for your coins, please watch our video, “Challenge Coin Design 101”. 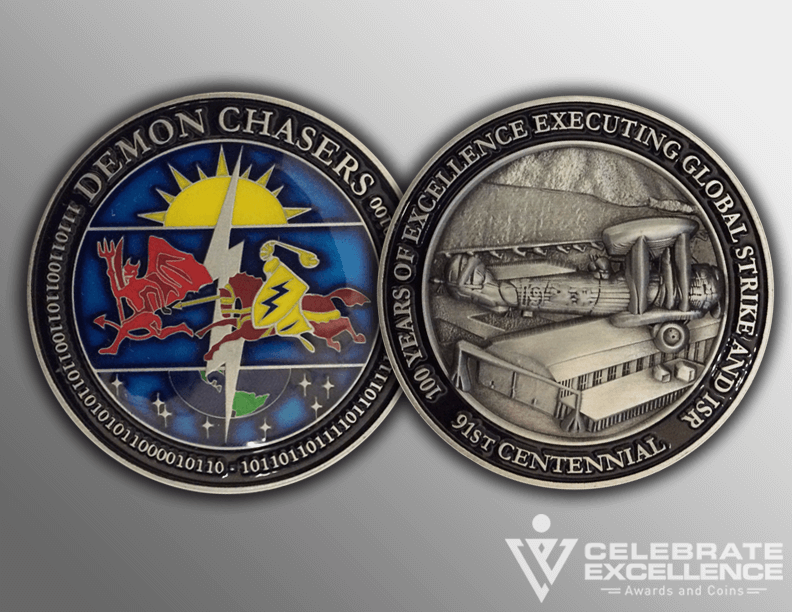 It is the most viewed informational video on custom challenge coins! 6. Get a quote and start your order! And feel free to contact us for a quote or to answer any questions! You can reach us at 1.800.662.8283. Yes, we’re real people! You can also request a free quote HERE. 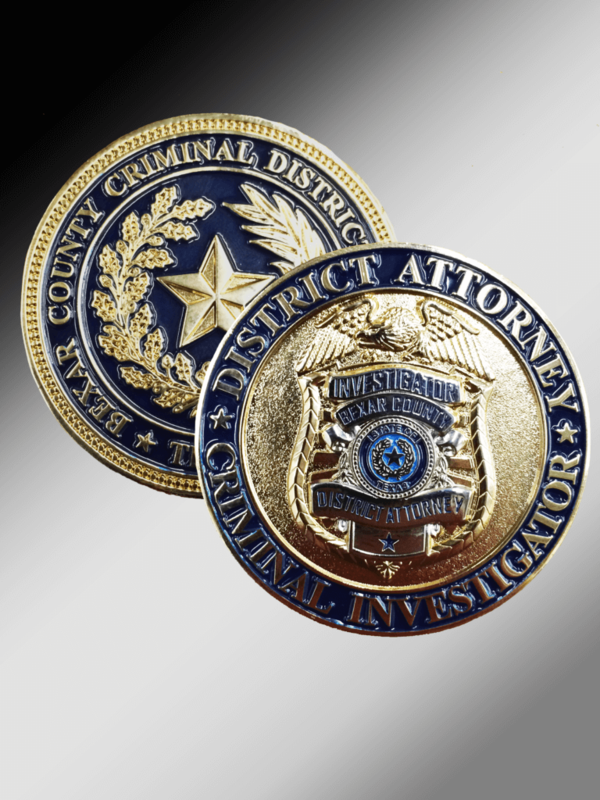 We are a small business with the highest rated challenge coin in the nation! We are BBB A+ rated; have over 300 on-line 5 star reviews; have all Google 5 star reviews. We were named “Winner – Small Business Achievement Award” for San Antonio by the North San Antonio Chamber of Commerce in 2017. The owner and founder, Tammany Williams, was named “2017 Small Business Leader in San Antonio”.